At around half past 1 in the afternoon Hong Kong time, boarding began with First (Suites) Class. We took a bit of extra time to leave the lounge, so boarding was already well underway when we arrived at the gate. Singapore Airlines boards through both the forward and rear cabin doors and the business class cabin is located up the stairs near the front door. Singapore Airlines operates an A380 on at least two of its flights out of Hong Kong. The aircraft consists of 12 First Class Suites, 86/60 business class seats, and around 300 economy seats. 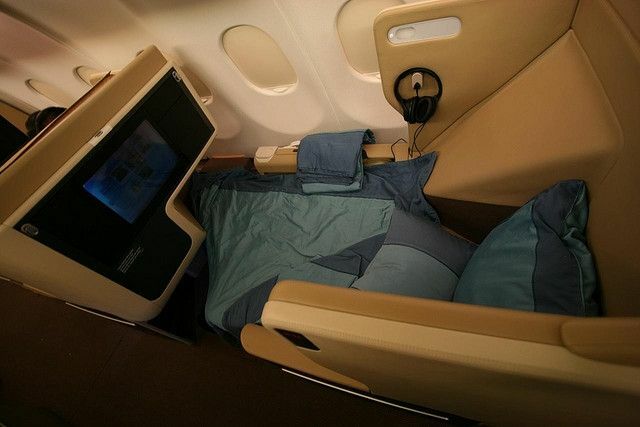 The business class cabin is split into two cabins: a smaller one with 16 seats, and a larger one with 42 seats. Upon boarding, my parents took the right turn into first class, while my sister and I went up the stairs to business class. As we walked through the aisle to our seats, I noticed that the ambiance of the cabin and mood lighting was really well coordinated to compliment the colors of the seats. I had seat 12A, while my sister was in 11A. My sister was initially a little mad at me for giving her the seat with no windows at the front of the cabin, but she got over it when she realized that she was going to sleep anyway. Singapore has really wide seats business seats, which are both private, and completely lie flat. In fact, I feel like Singapore shot itself in the leg when it came up with these seats since they were more or less as comfortable as the First Class ones. The seat features a large 20 inch screen, a multitude of ports for charging your devices as well as USB ports for connecting and watching your media on the IFE screen. There was also a large amount of space underneath the seat in front of you to stow away a small carry on or bag. If that’s not enough, the side bins provide even more storage for bags, books, and other items. As I settled into my seat, the captain came on the PA to inform us that they were finally loading the last bags and that we would be underway shortly. He also informed us of our longer than usual flying time of 4 hours 15 minutes due to some storms we were circumventing. As we were waiting for the boarding process to finish, I was quite unexpectedly handed a few of these in flight internet vouchers by the purser. It was a pleasant surprise since Lucky at One Mile at a Time often talks about the expensive nature of Wifi on Singapore. I thought this was an especially nice touch. I was then offered the business class menu and a glass of champagne (which I politely declined). The in flight service manager later came by to confirm our Indian Vegetarian Meal we had ordered and chatted with me about my travels so far. He seemed really enthusiastic about his job and went around the entire cabin just chatting with passengers. He sounded especially disappointed when I said I wasn’t stopping in Singapore and recommended a few places that I must visit within the airport itself. He would also later come by and hand me two more Wifi passes since he had some left over. Anyway, from the get go I knew the airline was what it was made out to be by all the media sources. The service was spectacular throughout the flight. Singapore Airlines offers a “Book the Cook” program where you can order your meal from one of the following celebrity chefs ahead of your flight. There was one caveat though: when I logged in online there was not a single chef offering a vegetarian dish on this route. I guess it’s not viable between Hong Kong and Singapore? Anyway I ended up just ordering the Indian Vegetarian Meal. For all the coffee lovers, it looked like there was quite the list of gourmet coffees. I personally just stuck to my Diet Coke with Lemon and tried out some of the Non-alcoholic specialties on the drinks menu. Of the unique creations listed above, I tried the Tropical Sparkle, and Orange Cooler. The orange cooler was the nicer of the two drinks IMO because the Tropical Sparkle seemed to have too much tomato juice. Honestly, though none of them were as nice as Cathay Delight. Notice how there are no vegetarian items on the menu above. This was really puzzling considering most airlines at least offer one such option on most flights whether it is a pasta or some other dish. FYI: ORDER YOUR SPECIAL MEAL AHEAD OF TIME! The cabin door closed at precisely 2 pm at which point the safety video began playing. There was a light drizzle outside and my window was a little foggy so I couldn’t get any decent pictures as we made the quick taxi to the runway. We were airborne within 15 minutes after push back and the seat belt was sign was turned off another 15 minutes later. At this point, the cabin crew sprang into action, coming around and taking meal and drinks orders. As I waited for the lunch service to roll around (I was starving), I got my laptop out and worked on some GMAT problems and blog posts. The service started off with a hot towel, some warmed nuts, and diet coke (not pictured). Within about 15 minutes of this I was served the appetizer tray with Plain Yogurt, Salad, and a Moong Dal Chaat served with Olive Oil and a choice of breads. The garlic bread and warm mozzarella bread were excellent. The appetizer on the other hand was average at best because it was out this world spicy. I think I drank a good gallon of water! The main course consisted of some Plain Paratha, Rice, Palak Paneer, Aloo Gobhi, and a Kidney Bean Curry (Rajmah). As you can see I was so hungry that I started eating before I remembered about taking pictures. The main course was of excellent quality, and was handily the best Indian food I had on any airline. After the lunch service was over, I worked some more on the blog and watched the Intern on the IFE system (pretty boring). And soon enough we had landed in Singapore and where it was a nice clear summer day. Apparently we ended up making up some time and arrived on schedule in Singapore (~6:20pm). It was a quick taxi to the gate and we were the first ones off the plane because the FA came around and escorted us down to the First Class area where our parents were. We bid adieu to the awesome crew and it was the end of yet another wonderful flight on this trip. We would see our seats once again in a couple of hours as this would be the same plane taking us to New Zealand. After we got off the plane, we made our way to the Singapore Airlines SilverKris Lounge in Terminal 3, where we spent the 3 hour layover. For the sake of keeping the photo line up shorter than what it is on this page, I have made that lounge review separate from the main post. Boarding for the Auckland flight began at around 8 pm local time with Suites Class boarding first. By the time we had gotten to the gate, they were already boarding economy class (on account of my wanting a last minute tour of the airport 🙂 ). Anyway we boarded through the front door as before, bid adieu to our parents and climbed up the stairs to the same seats as before. My sister fell asleep as soon as she sat down, but I decided to watch the Martian, which I had been anxious to see for a while. The captain came on the PA and announced that he was expecting an on “shed-jewel” (schedule) arrival in New Zealand and a smooth 9 hours 30 mins. The cabin crew understood that almost everyone seemed tired and abbreviated their introductions. We ran through the safety procedures and had a short taxi to the runway at which point we departed on time. My face was pretty much glued to the window for the first 15 minutes as I saw the full moon reflecting on the sea and the lights of the Indonesian islands. As you can see they had some holiday specials on the menu because it was the day after Christmas, but the menu overall seemed like it lacked vegetarian options for the main meal service. So it was nice that I had ordered a meal beforehand. The meal service started with some hot Indian appetizers, which included some Masala Vadas and boat shaped fried bread filled with paneer, chilies, and tomatoes. Both items were exceptionally good though the peppers were a bit too spicy for my liking. This was followed by some 3-Cheese Mushroom bread, an oddly cold appetizer (Vegetable pakora), green mint chutney, tamarind sauce, and plain yogurt. The warm bread was the highlight of this course, with the pakora being cold and uninspired. The main course consisted of Yellow Dal Tadka, Dal Makhani, Shahi Paneer, Jeera Rice, and Butter Naan. Though the naan was pretty much average, the rest of the items were restaurant quality and easily the best Indian food I’ve had in a flight. One of the FAs walked by as I was eating and offered to serve more naan, which came with the meal. However, I wasn’t really hungry to start with so I ended up having my tray cleared. I skipped dessert and ended up finishing the Martian. At this point we were somewhere between Southern Indonesia and the west coast of Australia. I looked around the cabin and noticed that everyone was fast asleep after having had their beds made. I wasn’t feeling too sleepy so I decided to catch up on some Indian films until I fell asleep. Even with the seat not in a fully flat position, it did recline quite a bit and I nodded off for a good 4 hours. I woke up to some turbulence while flying over the Eastern Outback. I tried going to sleep once again, but it was definitely too bumpy. I continued watching a Bollywood movies before breakfast service began around 1 hour out of Auckland. The service began with some hot towels and then we were served some the starter, which was some fruit and a choice of bakery goods. I didn’t really feel like eating too much so I just settled for a croissant and some fruit. By the time the breakfast service finished we were well on our descent into Auckland with 15 minutes to go. I didn’t get a chance to take any pictures on our descent into Auckland because my cell phone was dead, but it was a beautiful day with near perfect visibility. Upon a smooth landing, we had a quick 10 minute taxi to the gate. As we were preparing to get off, two FAs from first class came over and escorted us to where our parents were standing. We were off the plane in under 10 minutes and were finally setting foot on Middle Earth! It was so exciting! Bottom Line: Singapore airlines easily has one of the best business class products alongside Cathay. The service, entertainment, and meals were all outstanding, making it the best soft and hard product of any airline other than Cathay. And not to mention that Singapore Changi Airport is one of the best airports I’ve seen makes it a killer package. Given this, my one complaint would be that the seat has to be flipped over to become a flat bed. Call me lazy, but I hate getting up and waiting to have my bed made. Nevertheless, I look forward to the next time I fly Singapore Airlines because it is truly an unrivaled experience in the air, especially on the Airbus A380.